Your day is free to explore the world’s most romantic city before starting your cruise on the Seine. Get acquainted with the City of Light today with some shopping, strolling, or with a croissant and café au lait to watch the world go by amid the Parisian cityscape. DISCOVERY While sailing, enjoy a traditional French luncheon of authentic French crêpes followed by an onboard history lecture. In the Footsteps of Van Gogh, Bonaparte, and Louis XIV. Cafés, Cathedrals, & Canvases—The City of Light Truly Shines. Day 7 Paris: choice of guided sightseeing, or “Heart of Paris” walk, visit Notre Dame Cathedral, or WWII theme tour with visit to Museum of Les Invalides. This fabulous river cruise combines time in France’s unparalleled capital of Paris with beautiful views along the Seine River and the picturesque and historical region of Normandy. Embark on your adventure in Paris and sail to Vernon, where you’ll choose between two exciting guided visits—Claude Monet’s stunning gardens at Giverny or the remarkable Bizy Castle, known as “Normandy’s Versailles.” You may choose to go on an excursion to the historic Normandy Landing Beaches, including Omaha Beach, the Point du Hoc monument, and the American Cemetery. In Rouen, site of Saint Joan of Arc’s martyrdom, you’ll go on a guided walk through the medieval quarter and visit the gothic Rouen Cathedral—once the tallest building in the world and you will learn the important role played by this city during the French Resistance. Alternatively you will visit the battlefields in the area of Vimy Ridge and Beaumont-Hamel. From Conflans, go on an excursion to the quaint and inspiring town of Auvers-Sur-Oise—associated with several famous artists, including Vincent van Gogh—or visit Napoleon and Josephine’s Malmaison. On this French river cruise you’ll enjoy wine, cheese, history lectures by an expert travelling with you, and stops in charming and historical parts of France, but your adventure would not be complete without some time in Paris—one of the world’s most romantic and vibrant cities! The “City of Light” has Notre Dame Cathedral, the Eiffel Tower, and the Louvre Museum with its elegant glass pyramid contrasting its ancient architecture. A guided walk through the historic Île St. Louis with its narrow streets, and Île de la Cité where medieval Paris was founded, will be a delight or take a tour focused on WWII and visit the Museum of Les Invalides. After your river cruise, enjoy 3 nights in both Venice and Rome. You’ll fly from Paris to Venice, Italy, for a Monograms vacation package with guided sightseeing and a free day to explore the canals, bridges, and wonderful sights of Venice on your own. Next, travel by high-speed train to Rome. You’ll enjoy seeing the classic sights with a guided tour, and a day of free time to spend as you wish. 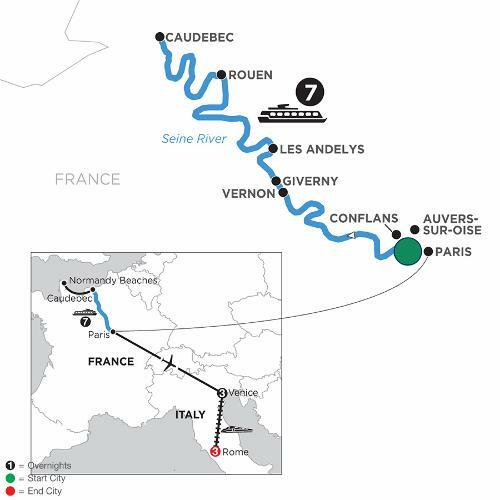 Participation in this vacation requires purchase of the following flights from Avalon Waterways, not included in the pricing: (1) roundtrip air from your U.S. gateway and intra-vacation air segments; or (2) intra-vacation air segments only, starting at $395. Required intra-vacation air segments: Paris to Venice. Air prices were effective on February 7, 2018, and their availability is limited. At the time you purchase your tour, air prices may be higher.